Throughout this life and others, we have been conditioned to accept certain beliefs about ourselves and the world and to doubt our own inherent spirituality. We can choose to flow with the stream of the collective consciousness and experience that journey, or we can choose to nurture our own divinity and enable the positive stream of creative energy and abundance to flow freely through us. The Trial of Time illustrates this life drama. 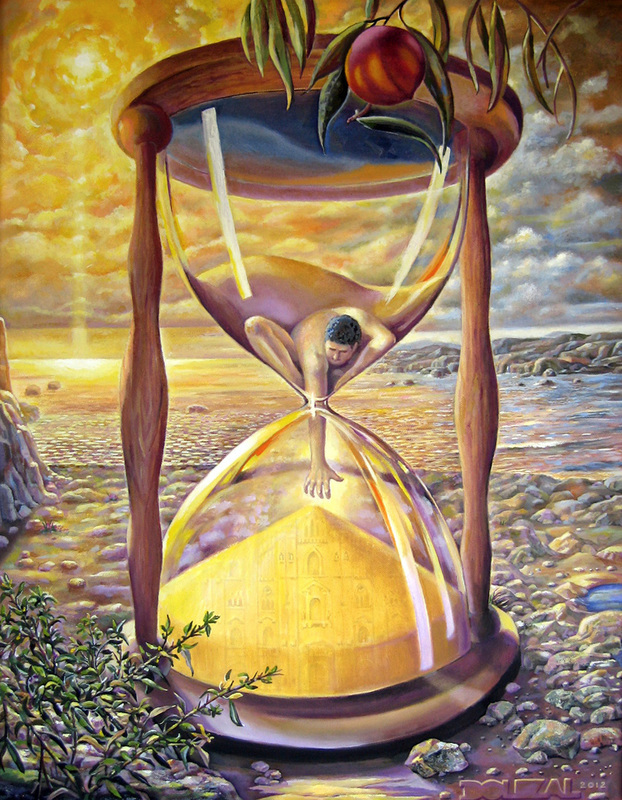 A man sits in an hourglass. He forces his arm through its narrow opening and strains to hold on to the provisionally accepted past, but by doing so, slows down the natural flow of the sand. The peach, created by the interrelationship of sunshine, water and carbon, represents cosmic intelligence but is also a symbol for longevity. Plants use the natural cycle of growth, bloom, decline and decay to insure the continuation of its species. Mankind similarly progresses through the four phases of life: learning, evaluation, teaching and incubation. The future will only become replica of the past unless you focus on the present.